Great foiling session - great flight time. 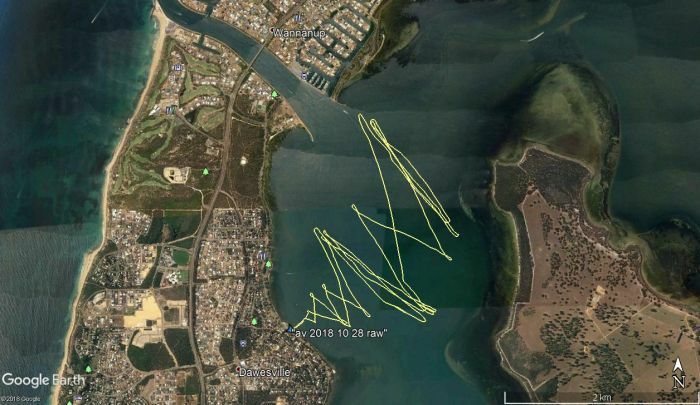 Great foil sesh with Otts who was looking very in control and having some nice runs, Im really liking the foil, so good to fly when only going 9.5kts. Attempting flying gybes and getting close. The bay is so good..
JP SLW (dented edition), NP RSRE E6 7.8m, NP RSS MWS. What a difference a day makes (that and +5knots less wind). With My freckle still a bit raw and sore from yesterday (not to far of the mark as I work up to more than a few hurties this mroning), Dawesville look a bit more Muppet freindly. So Stropp being more efficient and organised than me hit the water which I kept a close eye on him so see If I'd riigged ok, He looked ok so sail rigged. Second day of boardies so I din't even bother with my skinny boardies, only to find that I'd left my hi cut clown shows at home, Bugger! Hit the water, drifted down wind, tried to get going fumbled it and ended up wobble gybing (go figure), Change of direction and up on the foil still working downwind tis very nice so much different to yesterday. Played around close by tthe launch spot til Stropp stealthed me over the other side, recommending to go down towards liptions, so of we went, I was going ok till I saw how far he was going down wind, started following on the same angle, which gave my Naughty speed and 2+mins of silent screaming as It's been a while since I've gone down wind. Got down to the Nth groyne where Stropp decided to sail down the cut, With my skill levels I decided "bugger that" and turned near the groyne. Played around for a bit down there which was quiote nice kepping an eye on Stropp who eventually started returning, So after a mongrel up haul decided to head back. Still amazes me the angles these things sail as getting back was fairly easy. Apart from 3 mongrel uphauls whewre it felt like I had someone my size sitting at the top of the mast, it was an awesome session, slightly overpowered in places. Morts - i am keen to hear how you go with your FF22 and 6.8. I used mine with a 7.1 and it was at its top end, so I think it should be good with a 6.8.